After 13 years at Rollins, Oriana Jimenez is stepping down as the Title IX Coordinator to start her own business as a mindset and relationship coach. From starting in human resources, Jimenez worked her way up through two graduate degrees, four different positions, and two different departments at Rollins. Jimenez is leaving to pursue her passion in an entrepreneurial endeavour. “I have decided to take this moment in time to follow my passion into the next evolution of my career, and who I am destined to be in the world,” she said. She will start her own business as a mindset and relationship coach to help entrepreneurs thrive in their business and relationships. Jimenez leaves with a tremendous respect for all of her colleagues in the other offices of the campus who supported her work and a special appreciation for her boss Mamta Accapadi who always supported her goals and aspirations. While employed at Rollins, Jimenez wanted to leave a lasting impact on student safety. 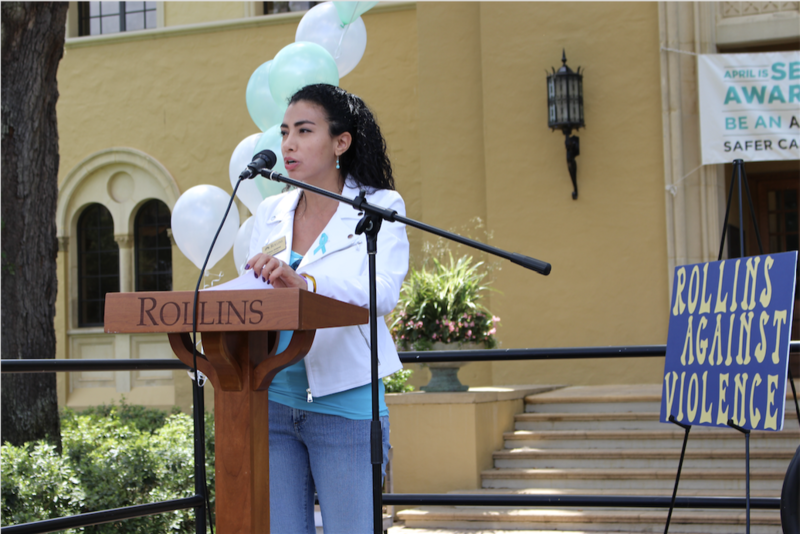 “I think my greatest legacies are in the annual Rollins Rally Against Violence which was honored during Sexual Assault Awareness Month in April for 4 years in a row,” she said. Jimenez is also responsible for the updated Title IX policy, which can be found on Rollins’ website. “It took a full year to prepare that revision and I think it’s a model policy,” she said. While Rollins searches for a new Title IX Coordinator, Dean of Students Meghan Harte Weyant will serve as the interim Title IX Coordinator. Title IX services will be supported by the Dean of Students office. “Please do not hesitate to contact the Dean of Students Office or Student and Family Care at (407) 646-2345, care@rollins.edu or email me directly (mweyant@rollins.edu),” said Weyant. Students may visit the Student and Family Care office in the Cornell Campus Center during regular office hours or go to Campus Safety at any time.